Monterey, California — Leading from flag to flag and holding off the pressure after a late race caution set up a sprint to the finish, young Mike Lewis brought Competition Motorsports its first victory of the 2014 IMSA GT3 Cup Challenge USA by Yokohama season with an impressive victory in Round 3 at Mazda Raceway Laguna Seca (MRLS). Lewis wasn’t the only Competition Motorsports driver with something to celebrate after the race, as he was joined on the podium by Fred Poordad, who took third in the Gold Class Masters Class. David Calvert-Jones netted a 2nd place finish in the Platinum Masters Class, but wasn’t able to spray the champagne as he was already busy strapping in to start the IMSA TUDOR United SportsCar Championship race in a GTD Porsche. 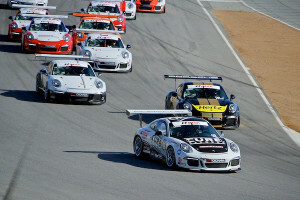 Blair Chang came home a frustrated ninth in the Gold Class, just behind Competition Motorsports teammate Mike McAlister.